Proven protection from chafing, infection and irritation. A chamois cream with an intriguing back story. Udderly SMOOth was conceived 30 years ago in Ohio, USA. As you'll guess from the name, Udderly SMOOth is a smooth lubricant originally developed to help safeguard milk cows against udder infections and irritations. Then farm hands reported that routinely using Udderly SMOOth at work cured their previously dry, chapped skin. 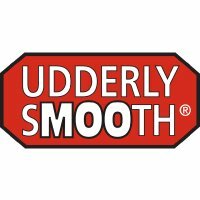 Udderly SMOOth's reputation as a greaseless, moisturiser / barrier cream grew by word of mouth. Udderly SMOOth has since been used to protect skin and offer relief from sunburn, windburn, shaving rash, nappy rash, paper cuts, eczema and psoriasis. Then cyclists discovered that Udderly SMOOth was an effective (and comparatively inexpensive) skin lube / chamois cream. Cycling Weekly rated it as their best buy in a chamois cream review a couple of years ago. This encouraged the Udderly SMOOth company to develop a shea butter-rich Chamois Cream that's thicker than Udderly SMOOth Original. 'Chamois cream is seen by many mountain bikers to be unnecessary or even a little strange. Although both of these viewpoints may well be true, a quality chamois cream will allow you to ride for longer periods and in more comfort. Personally I tend to use the brilliant Assos Cream (or 'minty arse lard' as it is affectionately known) on any ride over a couple of hours and swear by it. Indeed the Assos cream seems to be the default choice for most of the endurance biased riders I know. Consequently it was interesting to try out a new contender to the, err, throne.